Quo primum tempore ad Apostolatus apicem [From the very first, upon Our elevation to the chief Apostleship], We gladly turned our mind and energies and directed all out thoughts to those matters which concerned the preservation of a pure liturgy, and We strove with God's help, by every means in our power, to accomplish this purpose. For, besides other decrees of the sacred Council of Trent, there were stipulations for Us to revise and re-edit the sacred books: the Catechism, the Missal and the Breviary. With the Catechism published for the instruction of the faithful, by God's help, and the Breviary thoroughly revised for the worthy praise of God, in order that the Missal and Breviary may be in perfect harmony, as fitting and proper - for its most becoming that there be in the Church only one appropriate manner of reciting the Psalms and only one rite for the celebration of Mass - We deemed it necessary to give our immediate attention to what still remained to be done, viz, the re-editing of the Missal as soon as possible. It is Our will, therefore, and by the same authority, We decree that, after We publish this constitution and the edition of the Missal, the priests of the Roman Curia are, after thirty days, obliged to chant or read the Mass according to it; all others south of the Alps, after three months; and those beyond the Alps either within six months or whenever the Missal is available for sale. Wherefore, in order that the Missal be preserved incorrupt throughout the whole world and kept free of flaws and errors, the penalty for nonobservance for printers, whether mediately or immediately subject to Our dominion, and that of the Holy Roman Church, will be the forfeiting of their books and a fine of one hundred gold ducats, payable ipso facto to the Apostolic Treasury. Further, as for those located in other parts of the world, the penalty is excommunication latae sententiae, and such other penalties as may in Our judgment be imposed; and We decree by this law that they must not dare or presume either to print or to publish or to sell, or in any way to accept books of this nature without Our approval and consent, or without the express consent of the Apostolic Commissaries of those places, who will be appointed by Us. Said printer must receive a standard Missal and agree faithfully with it and in no wise vary from the Roman Missal of the large type. 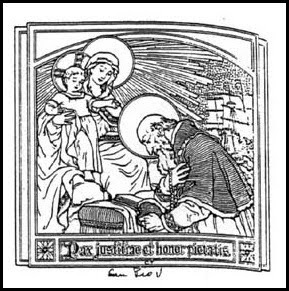 Given at St. Peter's in the year of the Lord's Incarnation, 1570; Pridie Idus Iulii [July 14], Pontificatus nostri Anno quinto.